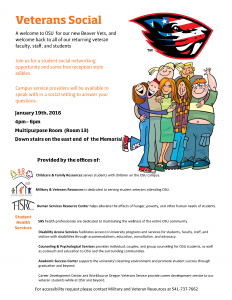 Join us in the Memorial Union (Multipurpose Room 13) between 4pm and 6pm on the 19th of January. New and returning student veterans and their families, as well as faculty and staff who have served are all welcome. Take this opportunity to connect with each other as well as gain more information about programs and services at Oregon State that can assist you while you are here. Food and beverages are provided.